It’s the month of love and friendship and the big day is fast approaching. One thing that I love about Valentine’s Day is that I get to pamper myself a little more. Whether I head to the spa or if I choose to relax, take my time and do it myself at home. I always want to make sure that I put my best foot forward and my footsies are smooth and perfect to, well, play footsies with my other half! Did you know millions of Canadian women tiptoe around flirting with their feet and are not using them to their full, fun potential!? I’ll be the first to tell you, I am not a fan of feet–I’ll be honest. One thing is for sure though, I want to make sure my feet look their best. Clean, trimmed and soft! Amopé National Survey by Angus Reid reveals Canadian women are far less confident about their feet and toes than men. Amopé is a complete line of foot and nail care products designed to inspire and help women look and feel confident with every step. It’s a way to get more ‘a-flirt-ive’ by showing your feet some love. Who doesn’t like that feeling though? 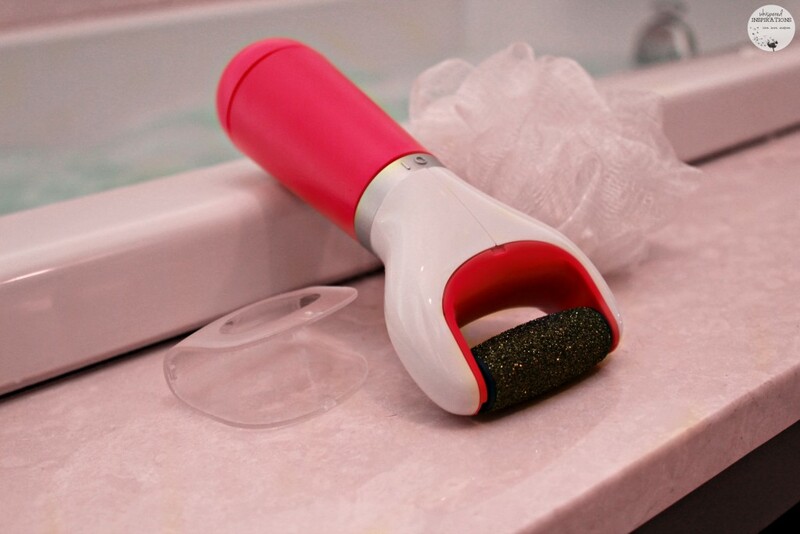 With their NEW Amopé Nail Care System, women everyone will be more a-flirt-ive! 2 million Canadian women avoid romantic situations that require their feet due to lack of confidence. 21 per cent, of Canadian men and women are open to getting up close and personal with their feet, while 71 per cent are not. Only 6 per cent of Canadian women use their feet for romantic play. Feet play an important role with Maritimers! 30 per cent of Maritimers say their feet play a role when cuddling on the couch compared to only 17 per cent of Quebecers. The Amopé Electronic Foot File is pretty amazing. Forget your pumice stone, this diamond crystal roller head has you covered and will leave your feet as soft as a baby’s bottom. No joke! I took a nice long soak in the tub, lit a candle and relaxed. Then I used the foot file, moisturized and I was ready to get my toes and nails in tip-top shape! The Complete Nail Care System. 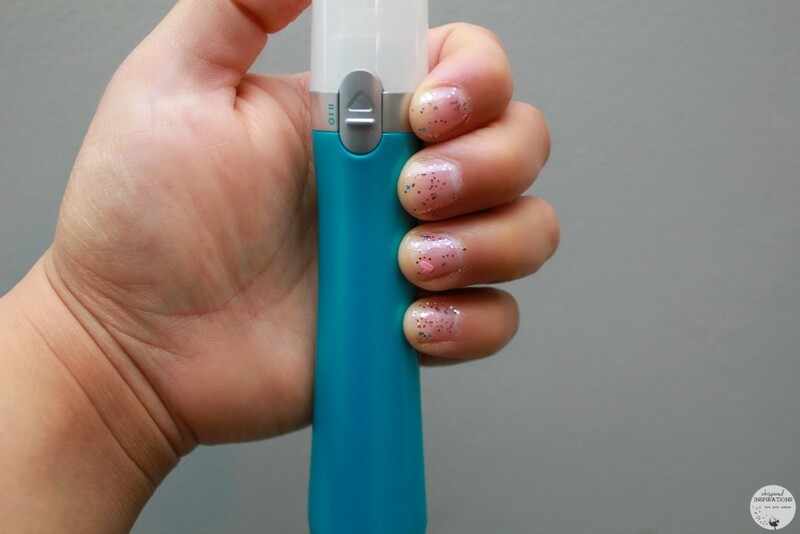 I couldn’t wait to finish my pampering session and to try out the Amopé Nail Care System. After drying off, moisturizing and slipping into my terry cloth slippers. It was time! The system comes with an electric nail file with 3 different heads for filing, buffing and shining for both toe and fingernails. Can we say shiny results? Yes, yes we can. 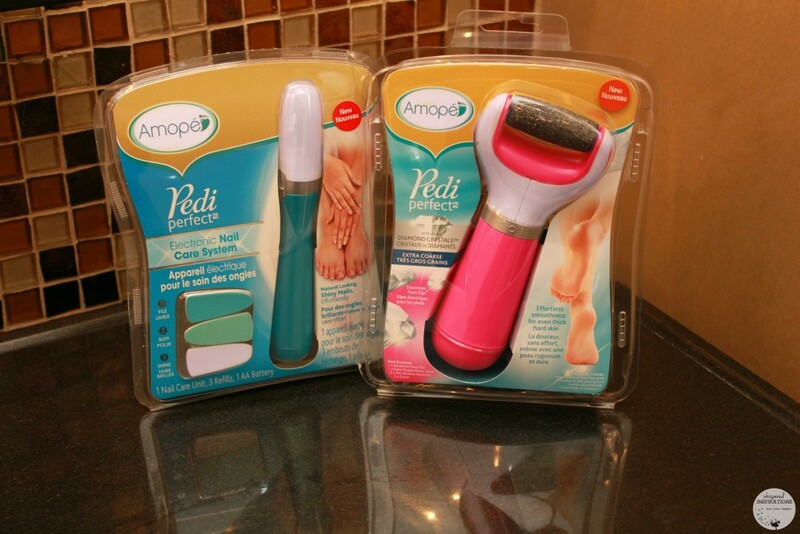 The NEW Amopé Pedi Perfect Electronic Nail Care System retails for $44.97 to $59.99 and you can purchase it at Shoppers Drug Mart, Loblaws and Rexall. You can also pick it up online at Well.ca and Amazon.ca! For my American neighbors, you can pick it up at Target, Walmart, Walgreens, CVS, Rite Aid or online at Amazon.com and drugstore.com! I am lucky to have a husband who loves to be pampered just as much as I love to be pampered. On our recent getaway to Motorcity, we were able take a candlelit bath, enjoy a double shower with massaging jets and give each other the Amopé spa treatment. It was the perfect ending to an intimate dinner out looking the city of Detroit. Very romantic! After working many years in health care, I learned to love having clean, short and trimmed nails. I still love to wear nail polish of course and after using the nail care system, I decided on a sparkly one. The Amopé left my nails smooth and the buffer made it so shiny! I didn’t need nail polish to make them shine! But, I added a little heart nail sticker and I’m good to go. Simple, clean and fun! One lucky Whispered Inspirations reader will WIN an at-home pampering kit! That way you can be flirté with Amopé all-year-long! This contest opens on February 09th, 2016 and ends on February 24th, 2016! Open to Canada only! For more information about products from Amopé, visit www.amope.com! You can always follow them on Facebook for the latest updates. Do you give yourself mani/pedi’s at home? I always get ready like its our first date , even though its been 18 years almost ! 😀 It makes us both feel good ! I could really use a mani/pedi in preparation for Valentines Day ! my feet are like sandpaper, and my fingernails are pretty rough – this looks like a great system! All of it . I have my bath and go get a pedi and mani. Do a mask and shave my legs. Definitely try to do my mani pedi, and take a nice hot bath. Make sure I have nice lotion on, and matching wear combos. Very important! I prepare by showering and putting on some makeup. I prepare for date night by taking a long bath, shaving my legs and a manicure! i have a long bath! I like to get a hot bubble bath and get all dressed up! I'm getting a mani/pedi and a hair colour. I prepare by taking a shower and washing my hair. I like a long bath, shave my legs, do my hair, and makeup and hope I look decent! I don't celebrate Valentine's Day, so I don't do anything special. This year its a Sunday, I'll just be home with the kids. Shower, facial and meditation setting intentions for a fun night out. Always with a mani and a bubble bath! I will be spending it alone with my pooch as hubby is out of town working, so I will probably order delivery. We have been Married for 36yrs and We still get gussied up for each other. Our youngest is 13 and comes out for dinner with us. She even gets all gussied up.LOL We never want to make our children feel unwanted. We have many special times when they are not around . I like to have a soak in the tub and shave my legs! Since I love bath, a long bath sound like a good way to prep to me! I can't say that I do anything different or special to get ready. I love doing a manicure and a pedicure to get ready for Valentines Day! I take a long bath and then moisturize. I definitely pamper myself and get my hair done. When I have time, if I have time, a bubble bath will do me! A bubble bath and some nice scented body lotion afterwards! I prepare by having a long bubble bath. I like to start getting ready by having a long bath. I like to take a nice bubble bath, do my hair and make up and paint my nail red. I like getting my hair and nails done. A long shower then makeup and hair. I like having a spa pedi, long shower to exfoliate and make skin smooth and soft. An Amope would be a good money saver than going to the spa. A mani and pedi, definitely! I like to take a relaxing bath.. I like dressing up by wearing something nice,I also do my hair and makeup! I prepare with a hot shower and shampoo and moisturizer. It never used to take me long to get ready. I take a bubble bath, pedicure and a face mask. With 3 kids it is had to get a date night let alone time to prepare!! Quick shower here!! Get my hair freshly colored, and time with hair and makeup. And a glass of wine! A mani/pedi always makes me feel special so is on my list for Valetine's day as well as a nice relaxing bath. Usually just a shower, quick fix to my hair and a little makeup. I use a nice scrub and a body moisturizer so to make sure my skin is silky smooth. Might be a good idea to save my legs before Valentine's Day…lol! We don't really celebrate V-day, but this year I'll be getting my romance on! I'll start with a long bath. I spend extra time on my hair – deep conditioning, blow dry, curling iron. This Valentine's Day the kids will be spending the night at their grandparents house the night before so I'll definitely take the time to have a soak in the tub and do a mani/pedi! I like to get a bubble bath! I love a nice mani pedi often. I don't just wait for date night. I haven't had a long bath in awhile unless having the flu bug and soaking in the tub counts.My one daughter has been obsessed about these for awhile!! I take a long shower and do a mini mani& pedi at home. Getting pampered is always a great way to start getting ready for anything! Whenever I have a fancy date night – it's a process. Exfoliating, nails, St.Tropez tan and a lot of time on hair and makeup. I take extra time though because I find it fun! I like to soak in the tub! I make sure my clothes are ironed. Nice hot bubble bath and get my hair done ! I don't usually wear necklaces, but for a date night or special day, I pick out a nice one to wear. Valentines day with a long bath where I floss well, shave, pluck brows and manage blemishes all from the bath.. with music! LOVE that tub in the pic …very nice..I've never seen one with the compartments for towels etc. Very cool ! I would prepare by taking a nice long bath…it is so rejuvenating. No prepping this year for Valentine's Day, Migraine today & they usually last a couple of days 🙁 But usually it is a shower, quick style to my hair and minimal make-up for date night. usually I would have my nails done, but i'm alone this year so I'm not doing anything. To prepare for a special date night I do a manicure and pedicure. I prepare for valentine's day with a nice bubble bath, shaving legs and pits, and also a manicure. If I had a micropedi then I would do that too! Happy Valentine's Day all! I would usually get a bubble bath! Shower, wash hair, shave legs, quick style to hair and a little make-up, nothing too fancy anymore! Take a long bath and get a mani. Mani/Pedi would be nice but I never get around to doing that. Our date night are usually nights in so not too much prep to do for those. If we are going out I do a little more. We usually just keep it casual, but a long bath is usually in order. This year we spent Valentines at home. The weather was extremely cols so we got into our pj's, made some popcorn and had lots of treats with some Irish coffees and snuggled on the couch. I prepare with a steaming hot shower, followed by a mani and pedi. I prep by changing my clothes :)! I like to prepare with a long hot shower. I would love to have the right tools to do an at home pedi! When I have a big night out with my sweetie, I like to soak in a warm bath with oils to soften my skin – he always notices & appreciates when I do this! Thanks for the chance to win. I get a shower,do my hair and makeup,and dress up nicely. Usually a shower, quick hair job and a bit of make-up, nothing too fancy! I dress up and show up! When I prepared for a night out, I tried to make sure I looked my best. We are older now and my husband is disabled so we have celebrations at home. I try to look as well as possible. I spend a long time picking out just the right outfit. It is always a mani for me, sometimes if I am energetic a pedicure as well. I take a long bath. We don't really get dressed up that much, pretty much a casual couple. But I do usually get ready by having a shower, doing something quick with my hair and a little make-up. We've been married for 9 years and date night is still exciting 🙂 We didn't celebrate Valentine's Day today, but we went the day before and I spent time doing my own manicure and doing my hair and makeup and picking out the perfect outfit! I like to get a bubble bath if I have the time! I try to keep my feet looking nice year round. I cannot stand gross looking heels. i enjoy getting a mani and pedi done but this year i had neither. I like to have a long relaxing bath to get ready for a date with my husband. I do a manicure too, if there's time. Haven't done either in a long time but I imagine I would shower, shave my legs, and all the usual things. A mani/pedi would be wonderful if I had the time and was able to do it at home. Simple, shower, quick hair do & a little make-up. Nothing too fancy! I have a foot scrubbie thing I use on my feet, but it's really difficult to use! I'd love to try this!! If we were to go out for Valentine's Day, I would take a long shower, curl my hair, and put on a bit more make-up to get ready for a special night. I like to get my hair cut and styled to prepare for a special day. I like to get a mani and pedi! I take a shower, change my clothes and brush my hair. Shower, quick hair do, little make-up – nothing too fancy after being together for 18 years. I like to have a bubble bath! I do a facial mask and moisturize my face; then do my makeup with extra special care. All of the above, mani, pedi, bath, shave. I take long hot shower. I like getting a long bubble bath! A loooong HOT bath would be a dream but that doesn’t happen all that often. Haha we don’t really celebrate Valentine’s as we love each other every day of the year! If I win this great prize, maybe I will add a mani & pedi to the mix. I prepare for date nights by washing my hair the night before so that I can do it nicely the day of 🙂 And I also make sure my nails are pretty – I always feel more pretty when my nails are done! A date night would be nice but not thinking it is going to happen anytime soon, we keep having other things pop up that require our attention and $. I like to keep my mani/ped's up all year. My thing is long hot showers with a lovely body wash and than a facial mask. I prepare for a special date by starting with a long relaxing bath. I take a long hot shower. More often than not our date night are spent at home so for those I don't really do much prep. I love soaking in a long hot bath, with lots of bubbles!